We all know that using our cellphones to talk and text while driving is a safety no-no – and in many states, it’s illegal. But is it OK to use a smartphone mapping app to navigate to your destination? Hands off that phone, urges California. A recent court decision in the state affirmed that holding your smartphone to navigate while driving is against the state’s mobile phone laws – even though said laws do not specifically address navigation. The case in question revolves around a driver named Steve Spriggs. He was given a citation in 2012 for using his cellphone while driving. Both Spriggs and the police officer say that the phone was being used specifically for the purpose of navigation. California’s cellphone law, like the laws in many other states, prohibits the use of cell phones while driving unless it’s configured to allow for hands-free calls. The law doesn’t specifically mention the use of phones for navigation. Still, that didn’t stop the judge from ruling the ticket valid, setting a precedent for drivers everywhere. 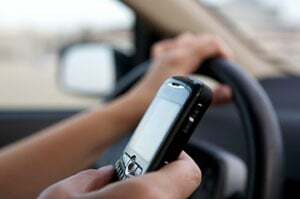 So if your state prohibits you from using your cell phone while driving, you should assume you’re also prohibited from fidgeting with it while driving no matter the reason. Not only could you get a citation – you could very well get into an accident.